mindswarms | I can't setup my webcam! 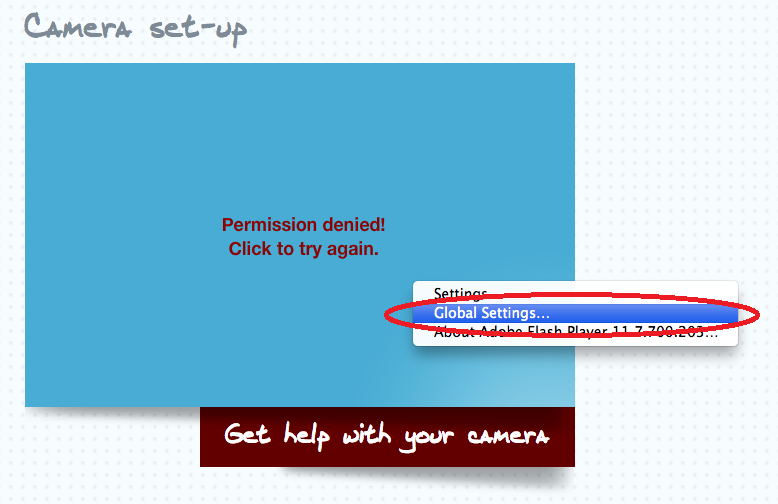 Home › Video Problems › I can't setup my webcam! If your webcam doesn't work on the testing site, it isn't your fault! Flash can be very fickle. 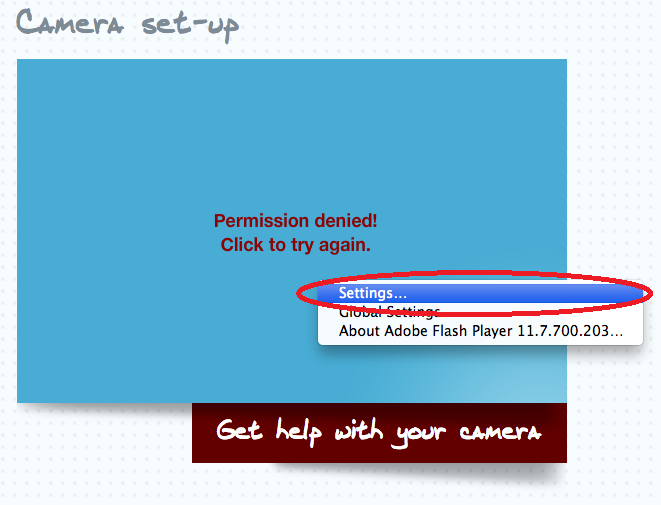 Here are some steps to take to get Flash working correctly. You should do each of these steps one at a time, visiting the testing site after each step until your camera works. Once your camera works on the testing site, it should work on MindSwarms. MindSwarms also has mobile apps for iOS and Android devices. You can download the MindSwarms App and complete studies from your phone! 1. Verify that your webcam is plugged in. Trust us, we've forgotten to plug it in a few times ourselves. 2. Try updating Flash. Go to http://get.adobe.com/flashplayer/ and download the newest version. 3. Find the camera on Flash. 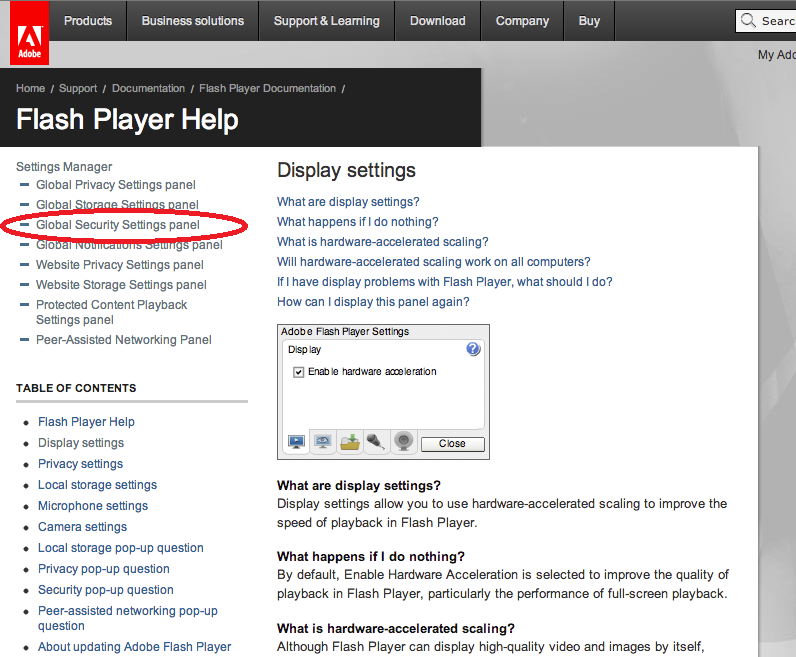 Right click (Control + click on Macs) on the Flash area and select "Settings...". 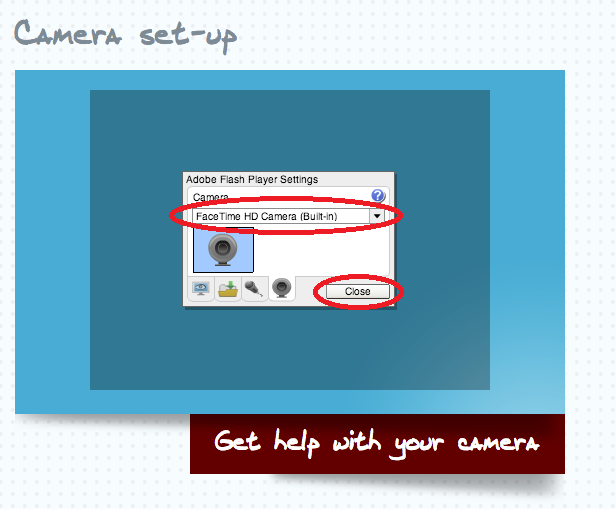 Click the camera tab and try each of the settings in the drop down box (in the example, it shows "FaceTime HD Camera"). One of them should suddenly cause the video to appear behind the settings box. 4. Try another browser if you have one installed. We've found the Google Chrome, Mozilla Firefox, and Opera have worked well for MindSwarms users. 6. Reboot your machine. After you have rebooted, repeat steps 3 and 4. 7. Clear the Flash cache by using the Website Storage Settings panel. Click the option to "Delete all sites" on the panel. Then try step 3 again. 8. 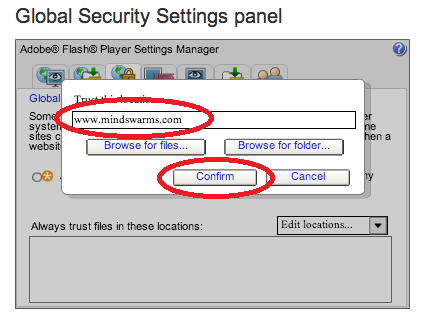 Add MindSwarms to your Adobe Flash Global Security Settings. Right click (Control + click on Macs) the Flash area and select "Global Settings..."
You'll be directed to "Display Settings." 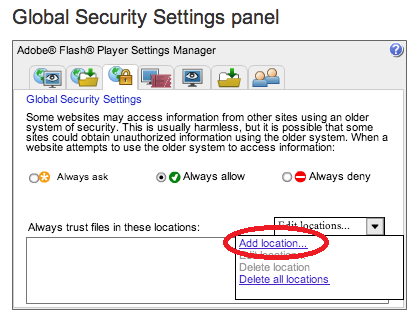 Click on "Global Security Settings panel" on the left sidebar. 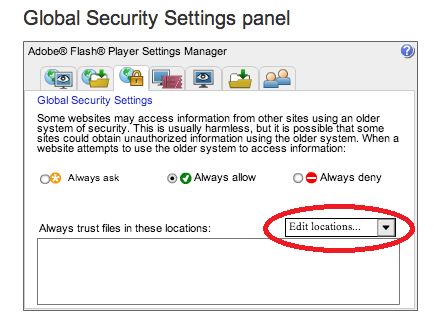 Once the Global Security Settings panel is open, click on the dropdown menu that says "Edit Locations." Click "Add location" and type "www.mindswarms.com" before clicking "Confirm." Refresh your page and try recording your sample video. Once you have your camera working, you may need to try setup on the MindSwarms site again. If you need to get to the setup again, click "Apply" for any study on your dashboard. You will be asked to complete setup before you are able to complete the application. If you aren't able to get things working after completing these steps, don't hesitate to send us an email at support@mindswarms.com.